Australia is one of the great gem markets in the world, and Australians have a deep appreciation for fine gemstones. Perhaps it is the strong Australian economy and the high standard of living, or perhaps the fact that Australia itself produces some outstanding gems, especially diamond, opal and sapphire. The huge Argyle diamond desposit in Western Australia was first discovered in 1979 and by the late 1980's Australia had become the world's largest producer of natural diamonds, with about one third of the world production. However, about 50% of the production is industrial grade diamonds, with 45% near gem quality and 5% gem quality. 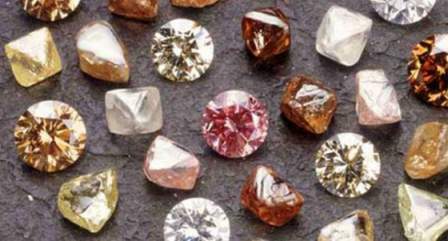 Australia is most famous for valuable pink diamonds as well as champagne and cognac colors. Sapphire has been mined in New South Wales and Queensland since the early part of the 20th century. By the early 1980's Australia had become the largest producer in the world of commercial grade sapphire. Most of the Australian blue sapphire was very dark with color zoning and a greenish dichroism, and this limited the market opportunity. But in the 1960's the Thai gem dealers figured out a way to lighten the color of this material by heat treatment. However, by the mid-1980's Australian sapphire was supplanted by higher quality Thai and then Madagascar sapphire, and the Australian production has declined. Large scale sapphire mining is no longer economic in Australia. Opal is the gem where Australia leads on both quality and quantity. Until recently, Australia produced about 95% of the world's supply of opal, and all of the black opal. Most opal comes from South Australia (Andamooka, Coober Pedy and Mintabie) with black opal from Lightning Ridge in New South Wales. 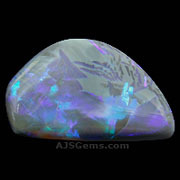 In 2008, a major find of light base opal in Ethiopia posed major competition to Australian opal, with prices about 30% below the Australian material. Australia is also the source for a number of semi-precious gems such as chrysoprase, zircon, amethyst, sodalite, chrysoberyl, chrysocolla and coral. Australians are avid buyers of high quality gems of all sorts, and many Australians buy their gems online, chiefly from gem dealers in Thailand. Even most Australian gems are cheaper in Thailand, since that is where much of the rough stone is cut and polished. But many of the gem varieties popular with Australian buyers, including ruby, tsavorite garnet and tourmaline, are not found in Australia at all.